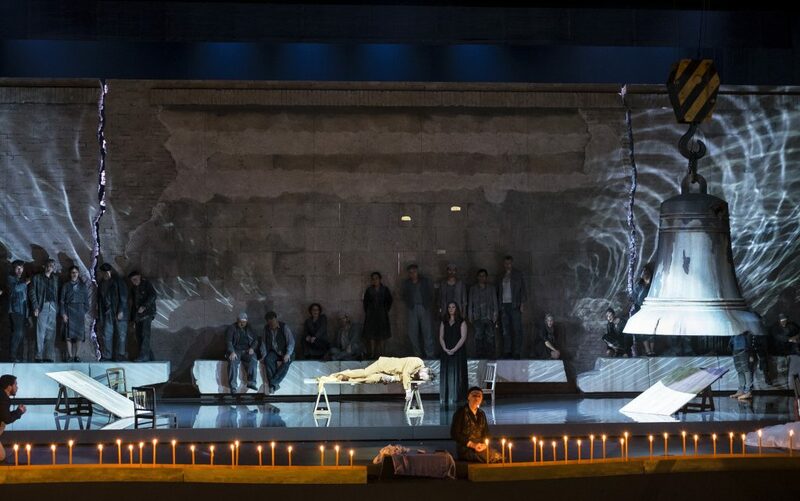 A little over a week ago, The Aalto-Musiktheater in Essen witnessed this season’s final performance of a new production of The Greek Passion. 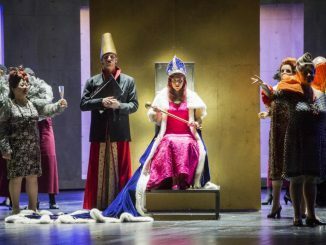 It is to be hoped that Jiří Heřman’s gripping production of p seldom-performed opera will return to Essen before long, for rarely has an opera performance proved so hauntingly topical. 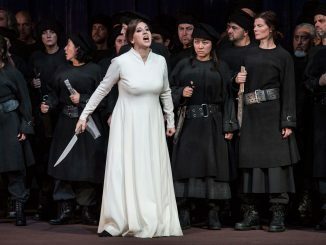 The Greek Passion can be qualified as a truly European operatic endeavour: the opera is based on the novel Christ Recrucified by Nikos Kazantzakis, a Greek author. It is set to music by Martinů, a Czech composer, who has also produced the opera’s libretto – in English, since the opera was supposed to premiere in London. It is ironic that, in this European work of art, the exact failings and difficulties that divide Europe today are on display so poignantly. One cannot help but think of the countless refugees currently stuck in the corners of Europe under barely humane circumstances. Martinů’s opera, like the novel, is set in an isolated Greek village, Lycovrissi, during a time in which Ottoman attacks on Greece were still a regular occurrence. Village life, however, seems to take place in an isolated bubble of relative bliss. Just after Easter, Grigorios, the village priest, announces which villagers have been selected to perform in the local passion play next Easter. The town’s prostitute Katerina is cast as Mary Magdalen. Her pimp and all-round shady character Panait is to play Judas, and the shepherd Manolios is to be Christ. The actors are told to take their roles very seriously and to inhabit their characters as much as possible in their daily lives as well. The true test of character, for the actors, for the church and for humanity in general soon presents itself in the form of a group of refugees from a town that has been sacked and burned by the Ottomans. The reaction to the refugees’ arrival is far from positive, and when one of the villagers dies, priest Grigoris incites the people against the refugees actively by claiming that the refugees are suffering from cholera, are highly contagious and should depart immediately. The refugees settle on nearby Mount Sarakina, a dry and rocky area, where starvation awaits them. Manolios struggles with his role as Christ; he feels distracted by amorous feelings. He is engaged to the light-hearted Lenio, who seems like the worst possible match for the brooding shepherd. At the same time, he struggles with his feelings for Katerina, but manages to overcome them. He then makes it his mission to help the refugees, as Christ would have. The actors in the passion play and subsequently more and more villagers follow Manolios’ example and aid their starving fellow countrymen on Mount Sarakina. At the same time, feelings of bitter jealousy arise among Grigoris, important public figures and Panait, who feel their influence slipping away. Their attitude towards Manolios becomes increasingly hostile. As tensions mount, the famine and wretched come down from Sarakina to demand help. Manolios speaks in their favour, but chaos erupts and the crowds turn against Manolios. Panait/Judas ends up stabbing him to death. The opera’s story in and of itself seems rather pessimistic about mankind. In spite of all our religious display and cultured façade, we are exposed as egocentric beasts, when we feel threatened by outsiders, by ‘others’. In the opera, one witnesses how locally-grounded one’s sense of self can be. The refugees are the villagers’ fellow-Greeks, but are perceived as threatening forces from ‘elsewhere’ nevertheless. What the two groups have in common seems to be completely forgotten, and it takes a second Christ figure to arouse some feelings of compassion among the villagers – in vain. The opera’s musical language is accessible. Both orchestrally and vocally, the sound is very warm and lyrical, with clear Greek and Czech local influences. Under conductor Tomáš Netopil, the Essener Philharmoniker lets the score soar to great heights. Jiří Heřman’s production is stylised and instilled with symbolic elements, such as basins of water in which principal characters truly seem to walk on water. The dress is mostly timeless, although there are some clearly recognisable Greek elements to some of the costuming, such as the priests’ dress. Heiman’s personenregie is powerful, and connections and disconnections between characters and groups are made very palpable. The singers of the opera house’s ensemble are all also more than equipped for their roles. 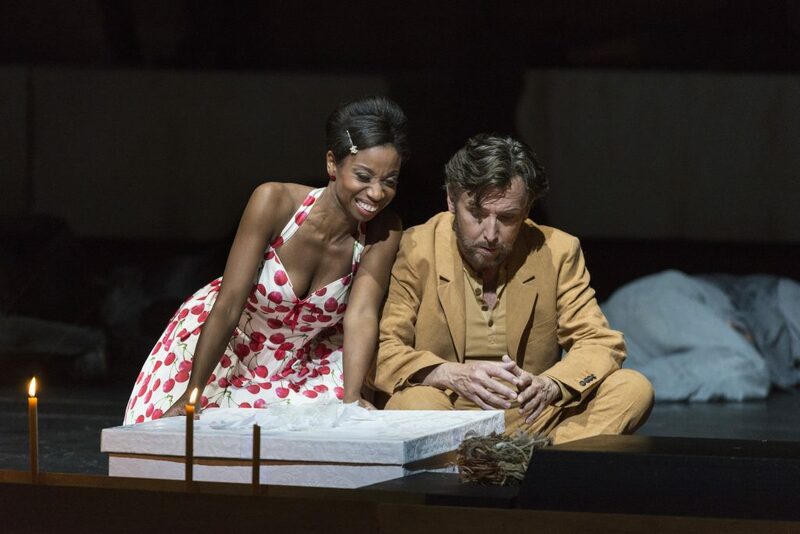 Jeffrey Dowd, as Manolios, expresses his character’s struggles and increasingly deepening conviction exquisitely in terms of singing as well as acting. Cristina Clark, with her light-voiced agile singing and utterly captivating stage presence perfectly embodied Lenio, who, contrary to her fiancé, only has marriage on her mind. Relatively new to the ensemble is Jessica Muirhead, a soprano with an agile voice, a very warm, rounded sound, and an acting talent that is simply gripping. Almas Svilpa sang and played a perfectly power-hungry Grigoris, who, in the scenes in which he was rid of his cloth, looked like a henchman on his way to commit a murder rather than an exemplary figure. The chorus of the Aalto-Theater also played an important part in the opera, and like all other participants, performed on the highest level. 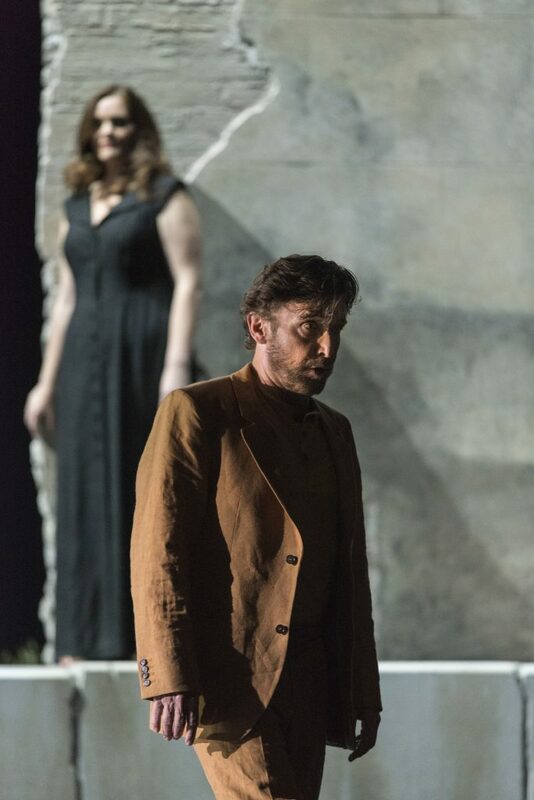 To encounter such a rarely-performed opera in such a high-quality performance made for a very gripping night at the opera. 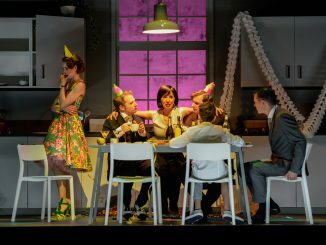 With this production, the Aalto-Musiktheater showed that they are an operatic force to be reckoned with.